Don’t let returning home from a nice vacation be a nightmare. Almost every 20 seconds a burglary is committed in the United States. Chances are the burglar was attracted to a home that was left in the darkness. Thieves look for “targets of opportunity”. 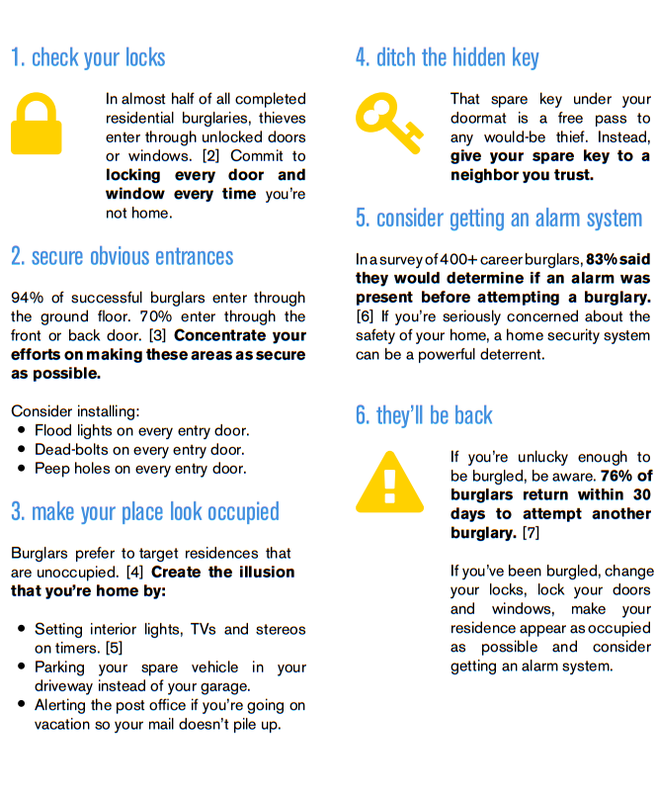 There are many things you can do to avoid becoming a burglary victim, especially when your are going to be away from your home for extended period. Have several home timers programmed to turn on lights along with a radio or television set at various times and locations throughout the house. Have a trusted family member, friend or neighbor look after your home. Have them pickup the newspapers, mail and garbage cans. Make sure all the windows and doors are locked. Make sure the doors of your home have adequate pick proof type dead bolt locks. Arrange to have the lawn cut and bushes trimmed. Ask your neighbors to check your home regularly, and leave a number with them where you can be reached in an emergency. Test your alarm system before leaving. Be sure that it notifies the central monitoring station, police department or key holder. In the event of a power failure be sure the battery backup is working. Make sure your Alarm Company signs are clearly posted. Do not leave a note on the door which may indicate your absence. Put away items such as jewelry, furs, cameras or coin collections in a safe deposit box or other secure place. Do not leave a message on your home answering machine which may indicate your absence. Don’t hide house keys under doormats, flowerpots or similar places. Neighborhood Watch is a citizen involvement program, where citizens, in cooperation with local Police, directly participate in the detection of crime. 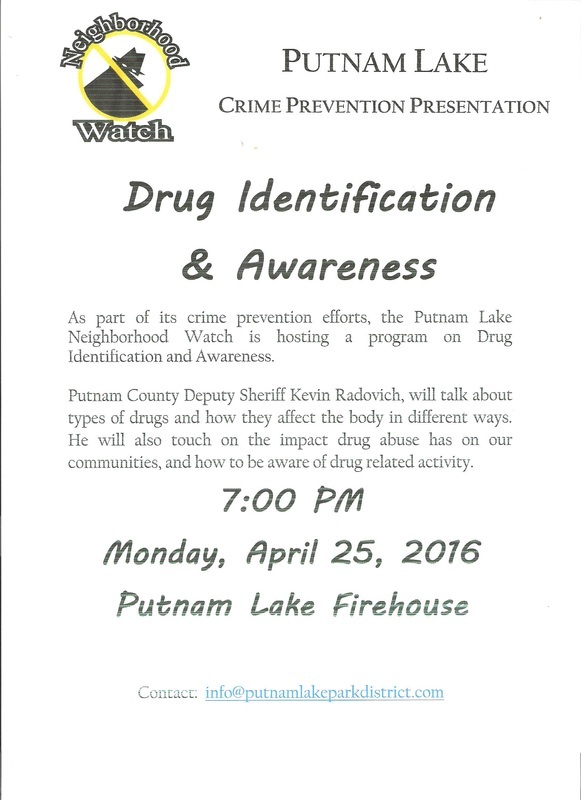 Citizens involved in Neighborhood Watch are trained in how to recognize suspicious or criminal activities and report these activities to the Putnam County Sheriff’s Office or the New York State Police. Neighborhood Watch Citizens provide valuable information to the Police which investigates suspicious activities, apprehend criminals and prevent crime. Neighborhood Watch can and will make your community a better and safer place to live. Neighborhood watch is not a group of vigilantes or lawless people taking the law into their own hands. Neighborhood Watch Citizens do not take the place of the Police in enforcing the law or apprehending criminals. · Act as a consultant to self-started community group. · Attend meetings and work with groups. · Explain how law enforcement agencies react and respond to reported crimes.
. Operation I.D. ; frauds and con games; how to report crimes; what to do if they find themselves victims of a crime. 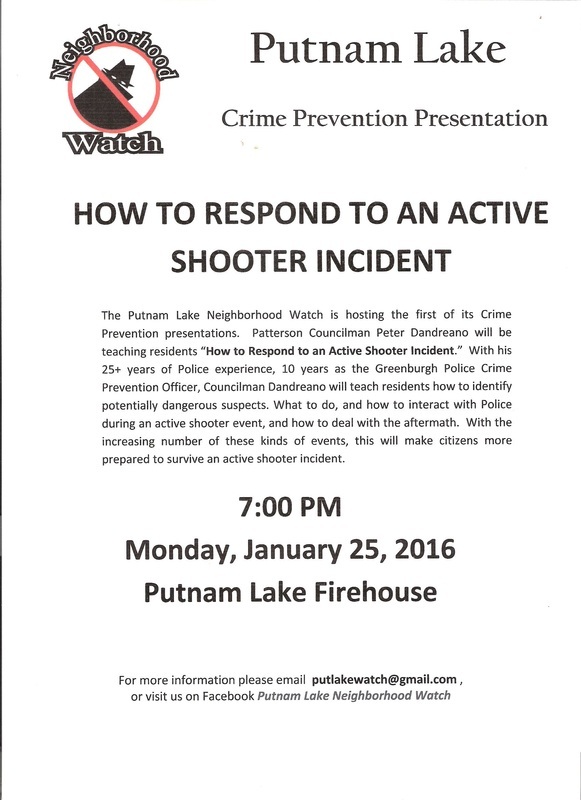 · Evaluate the effectiveness of the Neighborhood Watch Program. · Help in the selection of block captains. · Lay the groundwork for future cooperation. · Report suspicious persons or activities. · Accept deliveries for vacationing neighbors. · Keep key for neighbors. · Watch nearby houses or apartments. · Pick up mail, newspapers and advertising circulars. · House-sit for neighbors who have funerals or wedding in the family. Mow lawns, shovel snow, or turn lights on and off to give empty houses a lived-in look.